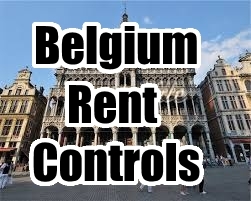 In our ongoing examination of tenancy laws and rent control practices in the European Union now looks at Belgian rentals. In 1991, an uncharacteristic rise in rents, particularly in Brussels and the surrounding area, prompted a statute devoted to private tenancy to be introduced into the Civil Code. This statute, which was reformed in 1997, aims to increase the equitable relationship between landlords and tenants, and ensure protection of tenants and their family housing. Additionally, the Belgian Parliament inserted into their Constitution, in 1993, the right to enjoy suitable housing as a fundamental right and freedom of Belgian citizens. Belgian tenancy law is subdivided into two parts: federal law and regional restrictions. At the federal level, it is stipulated that tenancy contracts do not impart any real property rights to tenants, with little to no ambiguity, and there is little in the way of consumer protection legislation, other than prohibitions and provisions for recovery from abusive contracts during the tenancy. Belgian housing is primarily owner occupied, accounting for 74% of the overall total, with a relatively low 19% of households acting as private tenants, trending downwards, and only 8% in social housing . Despite this, tenant associations are active in Belgium; recently, a list of “bad tenants” was published, advising landlords against letting to those on the list, as they were at least 3 months delinquent. Rent is freely agreed upon by tenant and landlord in Belgium, but according to Article 6 of the 1991 Statute, for any tenancy which contains a written contract, rent will be automatically adapted once per year in accordance with increases in the cost of living. Any contractual increase above this measure will be reduced to the legal measure. The parties to the lease may agree on rent increases or decreases between the 6th and 9th month leading up to the expiration of each set of three years. Since 1991, tenancies without set durations are no longer allowed: this duration is either fixed by the parties (for tenancies longer than 9 years, shorter than 3 years, or for the life of the tenant), or imposed by law if the parties remain silent. Furthermore, the lease cannot come to an end solely due to end of term, notice is required. In the absence of notice, automatic renewal will take place, under the previous terms of the lease. In May of 2014, the European Central Bank identified Belgium, France, and Finland as having high housing valuations, an early-warning sign of a potential housing bubble. The price-to-income ratio sits at 46% above its long-term average, indicating that incomes are falling relative to the price increases and according to the quarterly report published by the Belgian Federal Institute of National Accounts (INR) real estate in Belgium is 9% overvalued. European Union countries have had variable reactions to similar information; in the neighbouring Netherlands, in 2012, authorities imposed an LTV cap at 106%, which will fall to 100% in 2018. Additionally, the capital requirements for banks were raised, tax breaks for mortgage interest payments are being eased back, and these measures (coupled with the economic contraction) brought prices down by 20% in three years. House prices in Belgium had mirrored the Dutch, until 2010. In contrast to the swift reaction to the potential bubble pursued by the Dutch, Belgian authorities have pursued a policy of inaction. In the same time period that saw Dutch house prices decline, Belgium’s house prices have increased by 11%, and this has driven its buyers out of Brussels and Flanders. These buyers are even credited with improving house prices in the south-eastern Netherlands, where many Belgians have moved for the affordable housing. One identified cause of the inflation of housing prices in Belgium is the presence of European civil servants working in Brussels. The EU institutions exist within the city centre of Brussels, and as a result have had a direct impact on housing prices in the area. The failure of local planning has caused the singular purpose of the European quarter of Brussels. There remains a significant portion of the Belgian population who can and are willing to purchase property at current levels, but another large percentage are now being forced out of the market by this pricing increase. If this continues, these potential property owners will be forced into the rental market which is already afflicted by shortages.